Ride the gondolas and enjoy easy access to some magnificent view points and lovely walks! The timetable below is subject to modification, particularly in bad weather. Télécabine de la Gorge: from 30 june to 2 September 2018 (from 8:45 to 17:30). Télécabine du Signal: from 30 june to 2 September 2018 (from 9: 00 to 12:30 and 13:45 to 17:00. Dogs permitted in the lifts.Downhill mountain biking under your personal responsibility. Two gondolas facilitate access to the summit and the departure points of different hikes and trails. Free: for children under 5. Child rates : for children age 5 to 15. Family rate : -10% for a family of 2 adults and 2 children (available on round trip tickets only). Tickets, cards and passes are for sale at the bottom of the Gorge gondola. Single tickets for the descent only are for sale at the top of the lift. 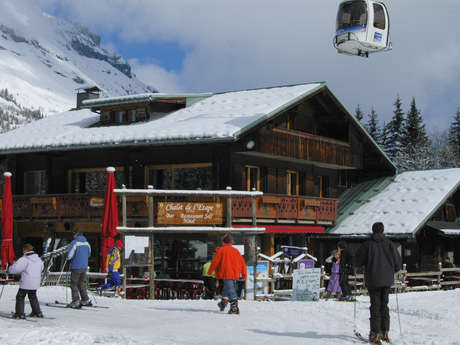 Les Contamines Hauteluce is part of the Evasion Mont Blanc area which includes the resorts of Les Contamines-Montjoie, Saint- Gervais, Megève and Combloux.